How to get there: A good starting point is the small village of Mittersill. 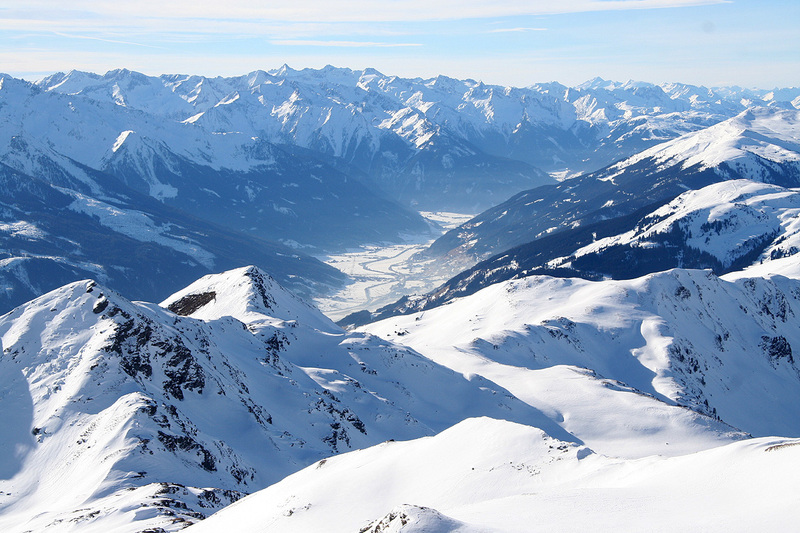 This is south-west of Salzburg, Zell am See is east on Hwy. 168 and Kitzbühel is north on Hwy. 161. A recommended place to stay in Mittersill is hotel Bräurup. This place has a good kitchen and nice rooms. They even provide Internet, however, they charge for wireless access, while providing their own PC for free. I guess this will soon change. 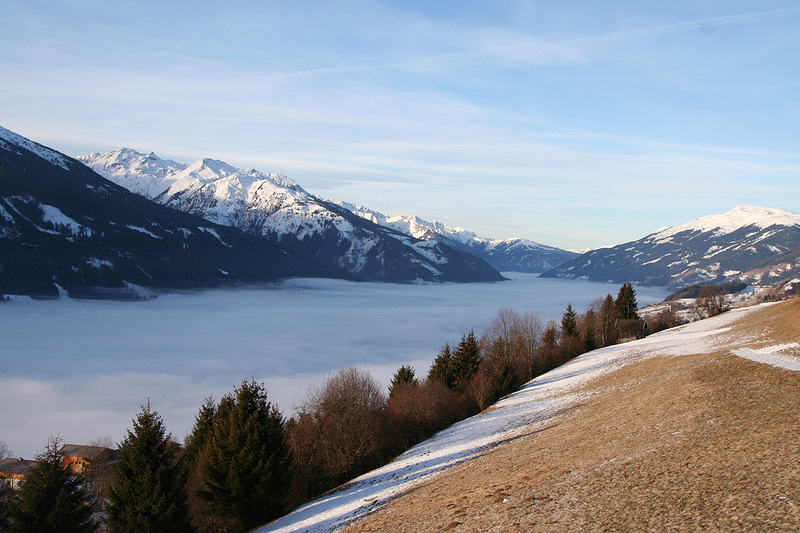 Driving from the center of Mittersill, in the direction of Zell am See, you cross a small bridge, measure from here. At kilometer 0.8, Hwy. 161 intersects from the right, there are several gas stations in this area. At kilometer 3.8, turn left off Hwy. 168, the sign says Stuhlfeldenr, this is a small village. At kilometer 3.9, continue straight uphill, do not fork left. At kilometer 4.0, turn right. You pass a yellow house on your left and you should fork left at kilometer 4.1, this is in the middle of the small village. The road now heads more uphill as it leaves the village. At kilometer 5.7, follow the road as it makes a sharp right curve. At kilometer 6.1, similarly, make a sharp left curve. At kilometer 6.9, keep going while making a sharp right curve. At kilometer 7.8, you make a sharp left curve and continue uphill to kilometer 8.5. 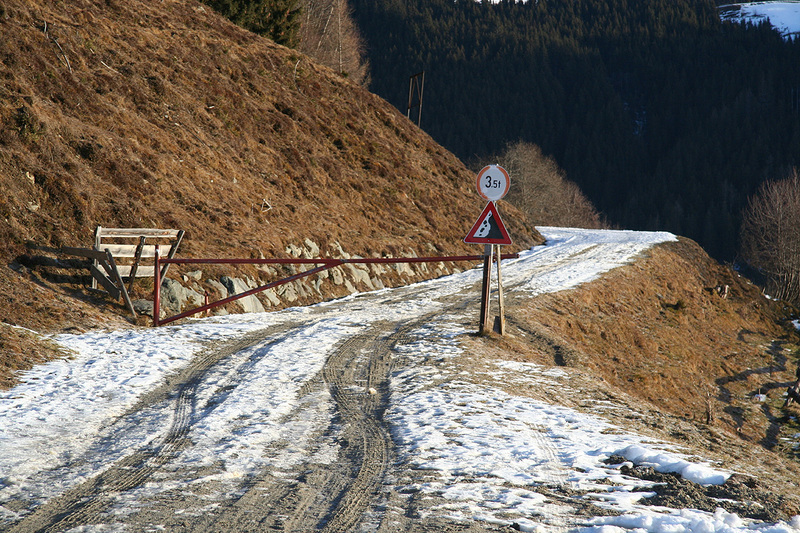 At this point, one road cotinues left, while another road heads right, closed by a gate. This is the trailhead, location N47:17.760 E012:31.064, elevation 1212 meter. Route description: From the trailhead, walk by the barrier and continue along this forest road. When it makes a sharp left stay with the road, a smaller track continues straight ahead. The road makes another right and after a while there is a significant road fork. The correct route is to stay right, ie. continue straight ahead (the other road makes a sharp left here). The forest road heads directly towards a place where the valley makes a significant bend to the left. The road gradually bends left as well and shortly after the new direction is established, there is a bridge and the road continues along the creek, but now on its right hand side (facing uphill). 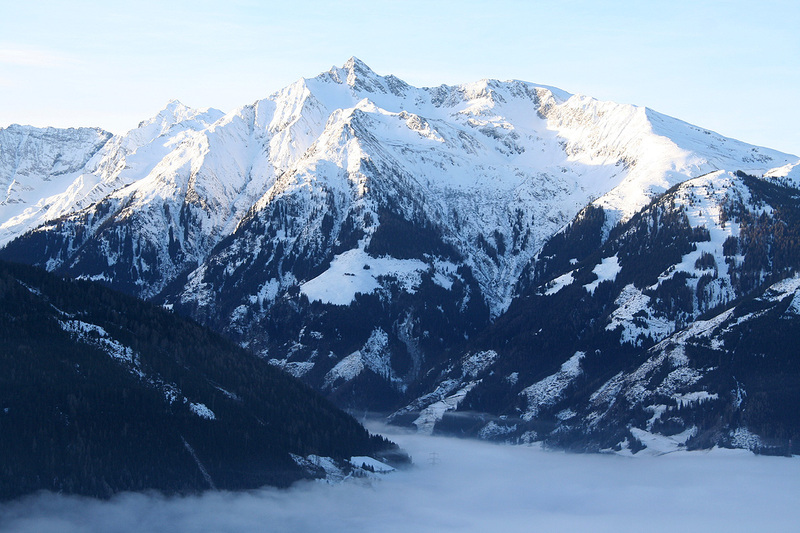 There are steep mountains on your left and the valley ends with steeper slopes blocking the way. 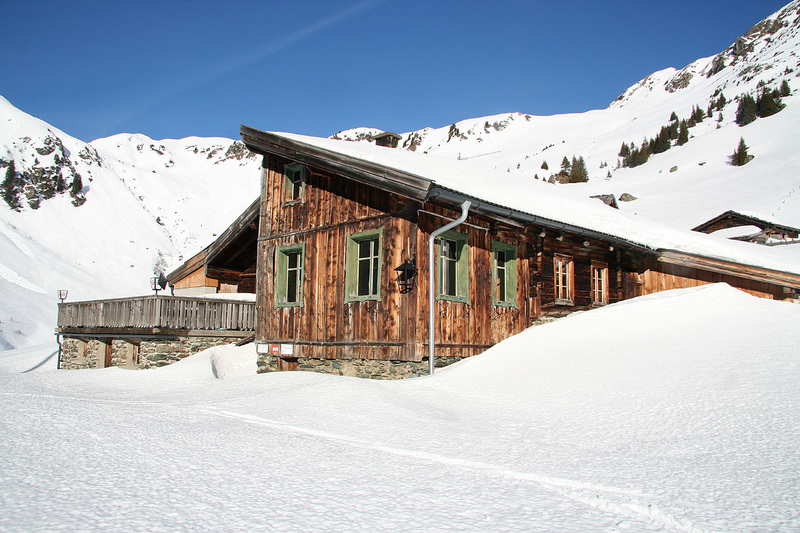 Almost at the very end is the mountain hut Bürglhütte, located at a nice plateau overlooking the inner valley. 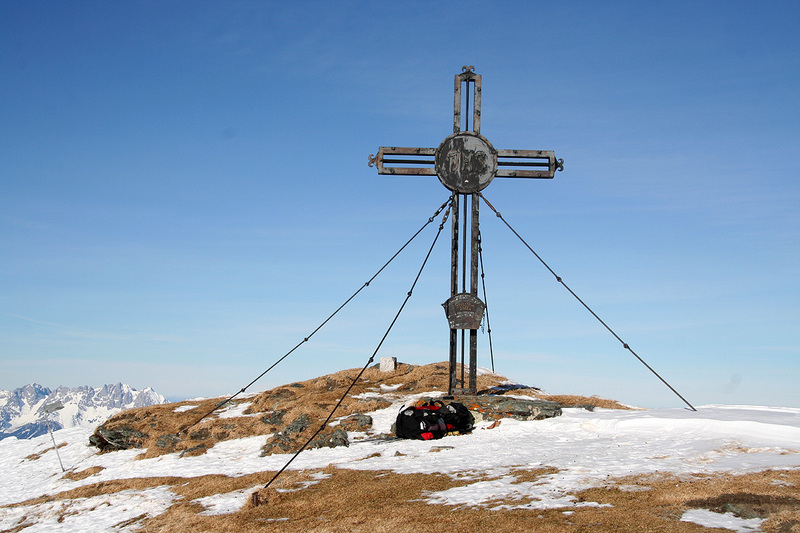 The location of the hut is N47:19.389 E012:29.766, elevation 1700 meter. Looking up the slope, there is sort of only one fairly obvious route that climbs terrain without any large avalanche danger. There are a few rather minor ridge formations that forms a quite natural way. 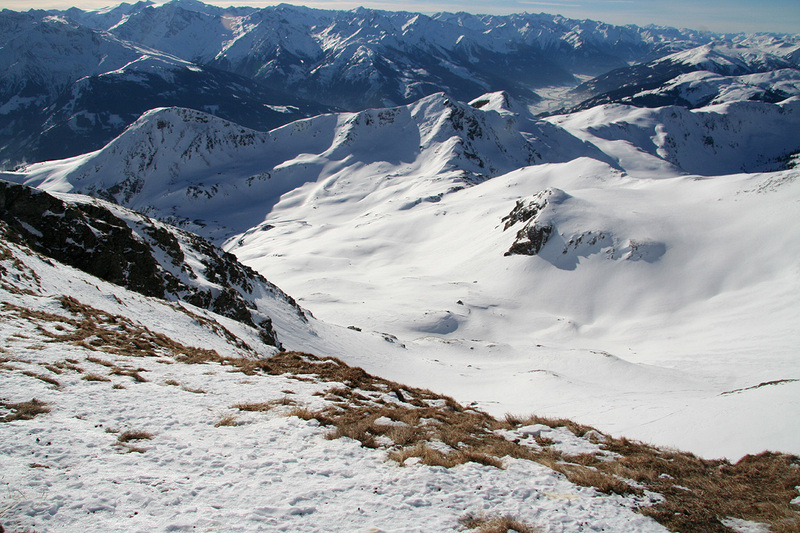 The skiing is not too steep and a nice left curve brings you up to somewhat more gentle terrain at location N47:19.835 E012:29.690, elevation about 2020 meter. Proceed uphill and towards the big bowl that the higher (and much steeper) mountain forms ahead. 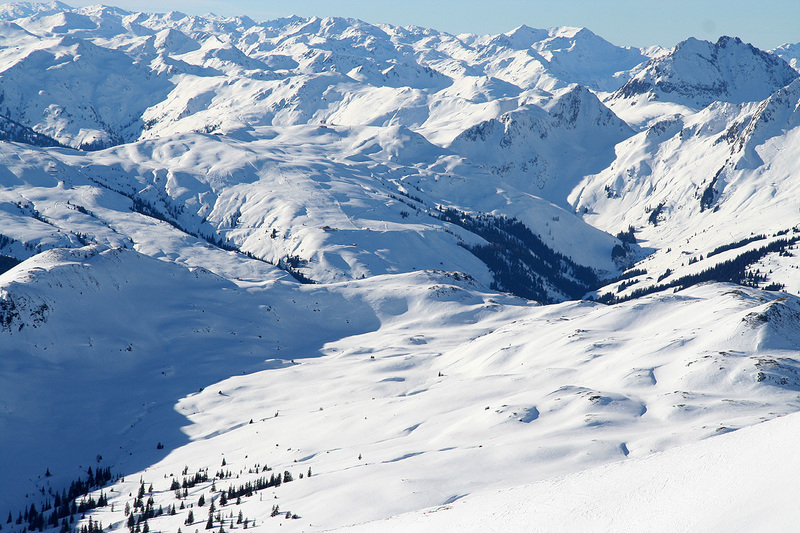 The route looks difficult, but as you ski all the way into the bowl, a possible route reveals itself to your right. Ascend this slope as it again gains a somewhat more moderately sloping section higher up. A point of reference on this route may be at location N47:20.202 E012:29.605, elevation 2250 meter. You are now just below the summit. Turn more left and continue climbing, this time somewhat more steeply. 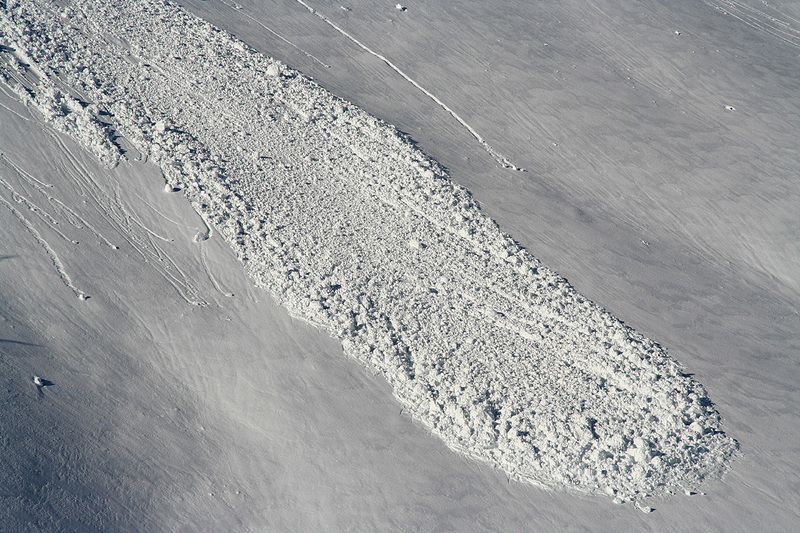 Evaluate the snow and avalanche conditions before attempting this final slope. One may be able to ski all the way up, however, when I did this trip it was most convenient to leave the skis near location N47:20.246 E012:29.651, approximately 50 vertical meter below the summit. Ascend the final slope, it is fairly steep, but one may reach easier ground towards the ridge both left and right of the very summit. Either way, you are now only a few steps from the top. The mountain is very steep on the far side, be aware of cornices. 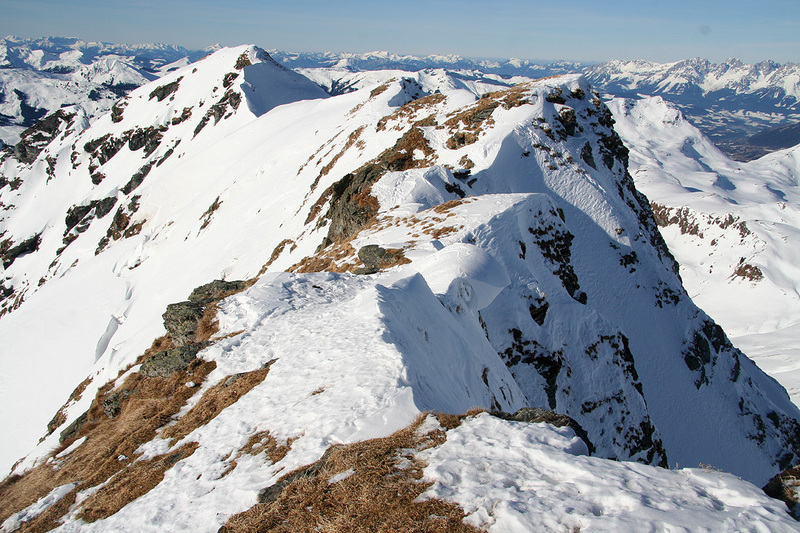 If you reach the ridge to the left of the summit, your final ridge is then also quite narrow just before the top. Comments: I spent a good evening and night in hotel Bräurup, Mittersill, then started out around 0800 the next morning. After taking the wrong turns a few times, I located the proper trailhead and parked. The valley was filled by fog, but here the sun was already shining. The views across the valley captured my attention. I started out at 0905 and walked along the nice forest road with my skis on the backpack. I had little idea about this peak and no adequate map, only "tourist" outlines. 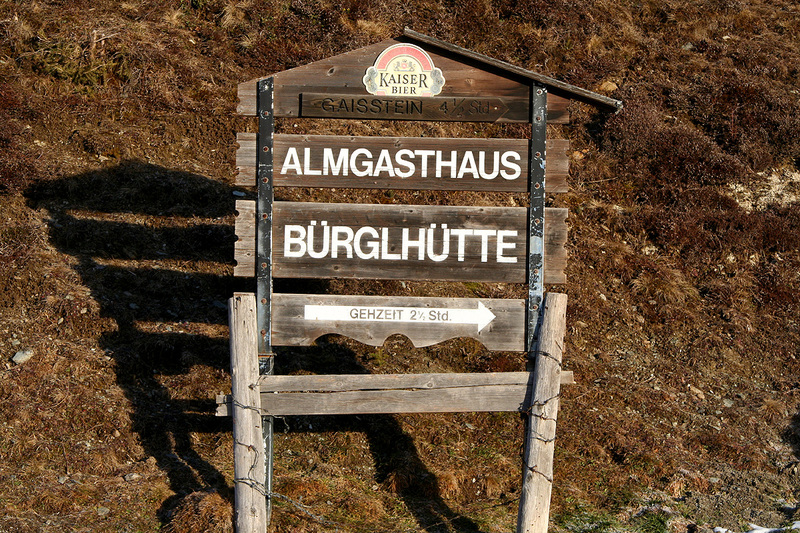 I knew that my route should pass a (closed) mountain hut called Bürglhütte. The trailhead sign indicated 2.5 hours to this hut, so I was pleased when arriving there already at 1030. After a short rest, I headed up the large slope. There was clearly only one reasonable route and at 1115, I was skiing in a very nice landscape above the initial hill already at an elevation of 2100 meter. The view back across the valley was already outstanding. The steeper part of the route was behind me, the peaks that had looked very high from the valley floor were now much more just across. The next section looked more complex. I had seen the Internet map which indicated that one should gain the ridge, then follow it to the top. The inner part of the huge bowl ahead looked steep. To gain the ridge (on my right) looked possible, but rather steep. 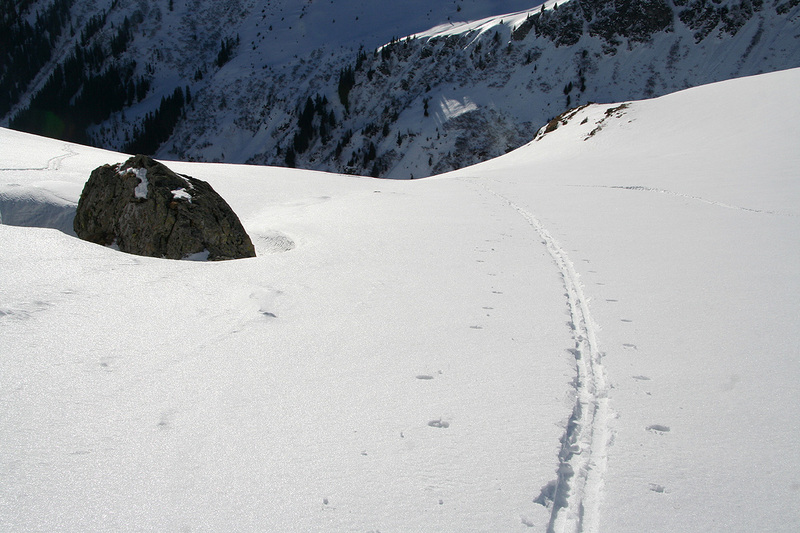 Just as I was pondering this question, I could see old tracks (by boots not skis), heading up to my right. Hmm. I should likely pay attention to what "the locals" used to do, so without much hesitation I parked my skis and headed uphill. The time was now 1130. The slope turned steeper higher up and I got onto dry land without snow. There were no rocks, just very hard, frozen soil. The horizon was close, showing that the terrain did not get any steeper. In order to proceed, I should likely have put on crampons to ensure a somewhat better grip for my boots. I definitely disliked the place and just as I contemplated my next move, I became aware of two skiers that skied downhill. Where did they come from? They obviously had not climbed the peak along my route, or I would have seen their tracks. 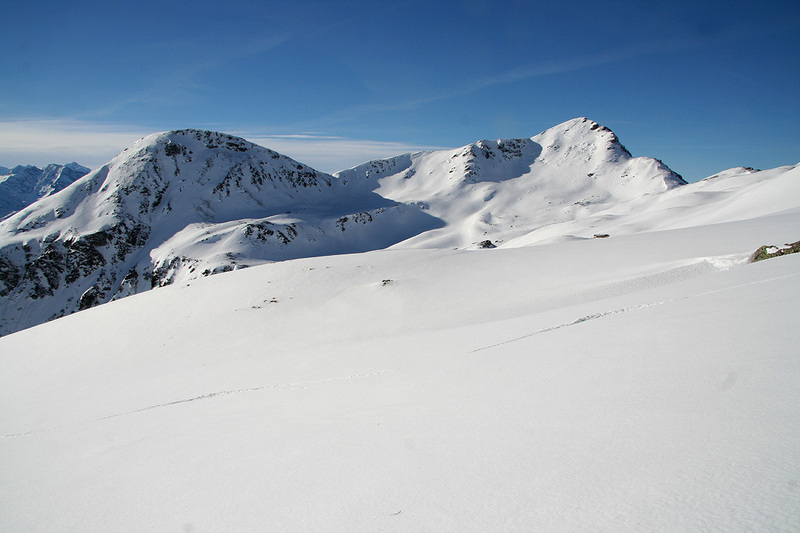 Thus, there was a skiable route further into the bowl. I carefully descended back down to my skis and (having "wasted" almost 40 minutes) continued skiing. There was indeed a very natural slope leading higher. This nice route had been out of sight from the earlier part of my route. I skied uphill, first a line to the left, then a longer traverse right that brought me to a somewhat more level area. From here, the slope gradually got steeper towards the summit. 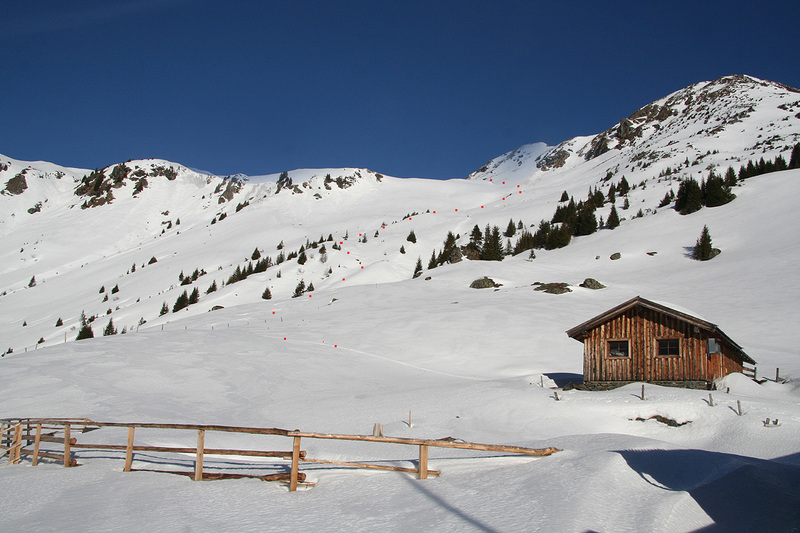 The slope had minimal snow and therefore minimal danger of any avalanche. I skied to about 2320 meter, parked my skies, put on crampons (I would have managed without), took one ski pole and my ice axe, then proceeded uphill. Higher up, I had the choice between a traverse left or right. The left seemed shorter. It brought me to the main ridge, revealing a vertical cliff on the far side. This ridge was easy, however quite narrow before attaining the summit area. I reached the summit at 1305, so 4 hours from the trailhead including a 40 minute "detour". I signed the summit register, had a small lunch and mostly gazed around on 360 degrees of mountain scenery. The sun reflected off a top station for a ski lift, making me aware of a ski area that seemed to be in the middle of the mountains. 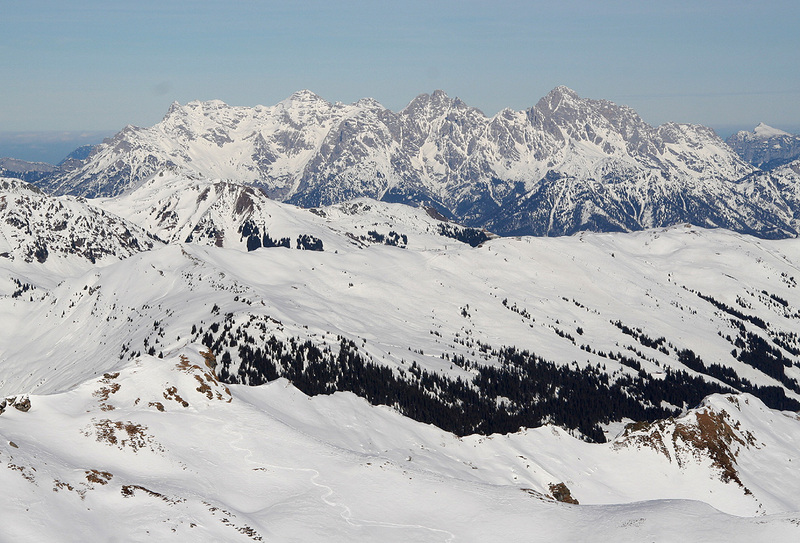 Most likley, there is a gondola that takes skiers from the main valley and up into that area. 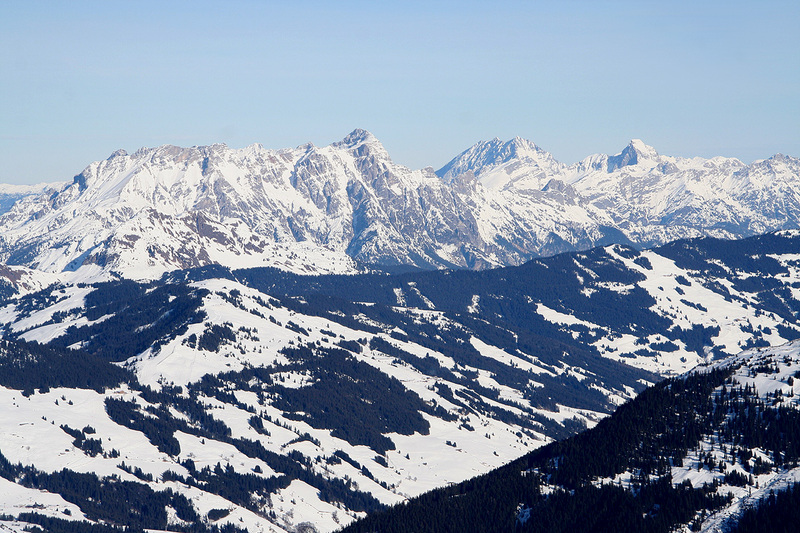 Impressive peaks everywhere, here you see Birnhorn, one of Austria's ultra prominent mountains. 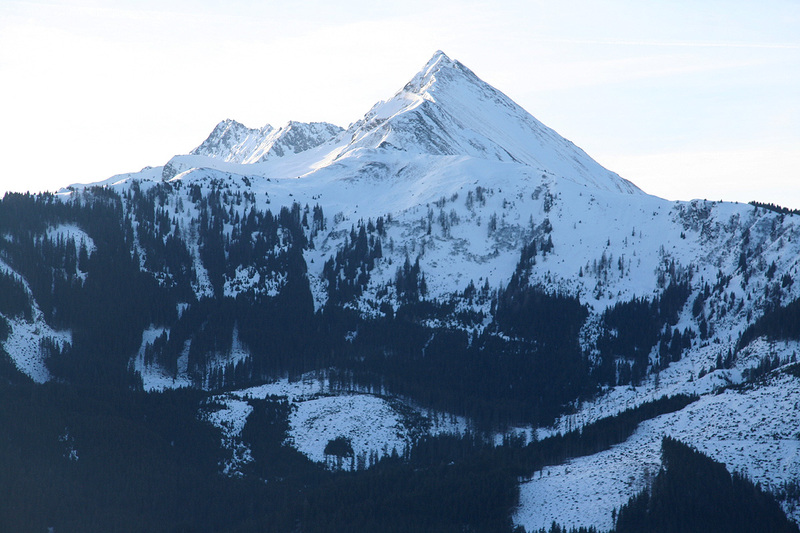 Geisstein is the tallest peak in the east part of Kitzbühler Alpen, this made for outstanding views (Grosses Ochsenhorn is the highest peak to the right). After about 30 minutes, it was time to descend. I skied carefully, being solo and in a pretty remote location. Back at the car around 1450, less that 1.5 hours on the return. 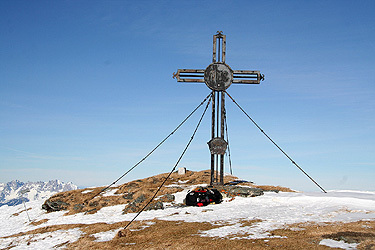 The summit cross on Geisstein. An impressive peak, across the valley, seen from the trailhead. 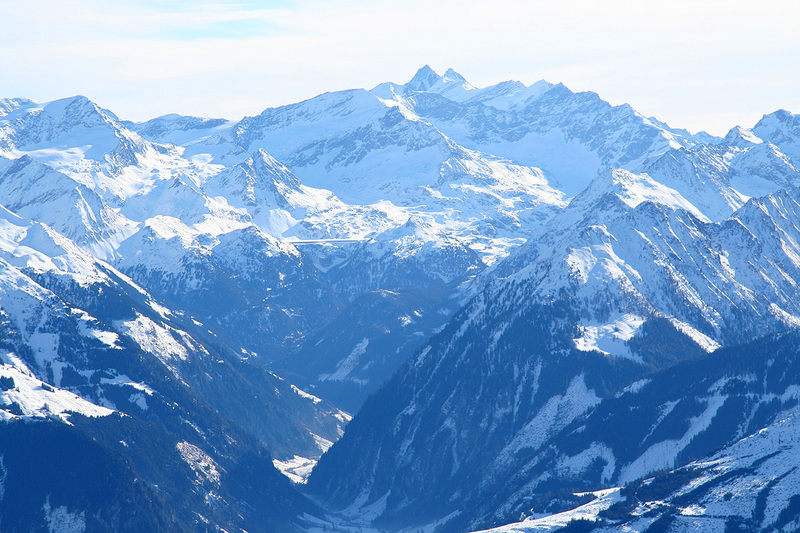 The upper valley, viewed from Bürglhütte. 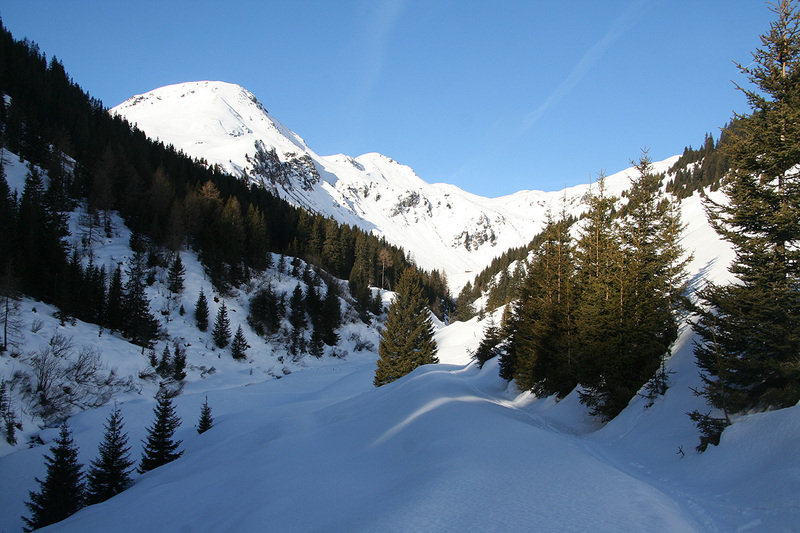 The upper part of the ski route. The route comes from the left, turns right near the right side of the picture and follows the terrain up to a somewhat steeper slope below the gras (cannot be seen in this picture). The slope lower down is also somewhat steeper than it looks. Grossglockner and a "little brother", also note the dam. The main valley as seem from the summit. Summit annotations above: Credit Jonathan de Ferranti.